CM Magazine: The Hungry Year. "Ryan," she said. "Could you take care of Alex while I go into the woods and cut a little bark from the trees?" She knew that people back in Albany used to make beer from the bark of spruce trees. Her father claimed it kept them from getting scurvy. "If we could boil a little bark in water, it might taste nice." Ryan made a face. "I don't think I'd like it, Kate. I'd rather keep drinking the sugar water." Kate did not have the heart to tell him that the sugar would soon be gone. She put a log on the fire and dressed in her warmest clothes. "Now you must not come outside. And don't let Alex come out if he wakes up. You watch from the window. I'll keep right in sight - most of the time, anyway." Ryan stood by the door, watching her closely. "I don't think this is a good idea, Kate," he said. His bottom lip quivered. Kate squatted down and wrapped both arms around him. "I'll not go far. You can watch me from the window." "But what if a bear or a wolf comes out of the forest? What will you do then, Kate?" 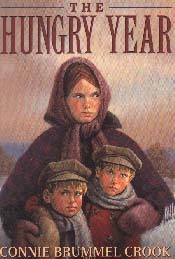 This novel is solid historical fiction based on events in Canadian Loyalists' lives as they struggle through the winter of 1787, close to starvation. It is a pleasure to include the story of 12-year-old Kate, her younger four year old twin brothers and her grieving father in the cache of Canadian books that support the social studies curriculum. Carrying a grown woman's load of work because of her mother's death in childbirth, Kate struggles valiantly under her father's constant criticism as they pioneer an isolated farmstead near the Bay of Quinte in Ontario. Kate yearns for her friend, Sarah. One day, her father doesn't return from hunting, and only their cat's rabbit catches and the actions of their Mohawk neighbours save the little family from starvation. Historical facts about food, clothing and survival are nearly slotted into this compelling story which will thrill younger readers and remind older students of Laura Ingall Wilder's American pioneer series. Kate's character develops through the story as she comes to understand that her father's grief is the cause of his gruff behavior. She realizes that she can rely on the help of neighbours and stand up for herself when she knows she is right. The twins' four-year-old enthusiasm is contagious and many a babysitter's heart will be touched by Kate's attempts to keep her brothers happy even as they are all close to death. Kate's father's tyranny mellows as he realizes how Kate has grown up and how helpful the neighbours have been. Detailed descriptions of the ferocity of spring blizzards and the relentless cold add authenticity and suspense to The Hungry Year. Some 225 years ago, the United Empire Loyalists who were given Canadian land by a grateful British government laboured valiantly to create safe homes for themselves and their families. Kate's story will bring alive their resourceful determination.